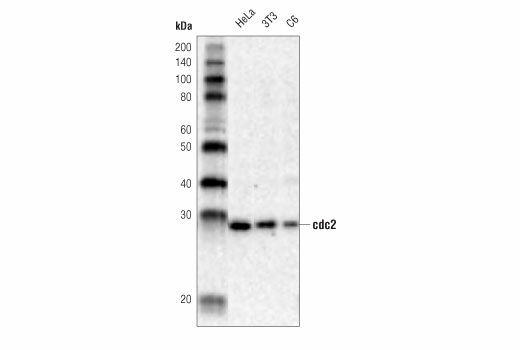 Western blot analysis of extracts from HeLa, 3T3, and C6 cells using cdc2 Antibody. 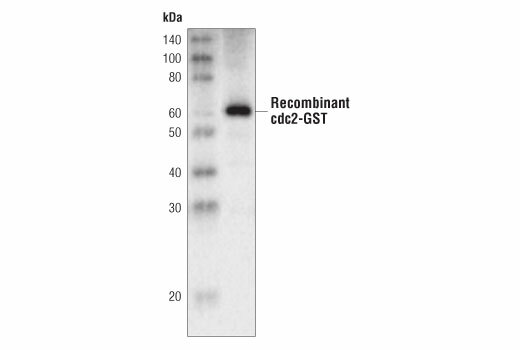 Western blot analysis of human GST-tagged recombinant cdc2 protein using cdc2 Antibody. cdc2 Antibody detects endogenous levels of total cdc2 protein. Polyclonal antibodies are produced by immunizing animals with a synthetic peptide corresponding to residues surrounding Asp289 of human cdc2. Antibodies are purified by protein A and peptide affinity chromatography. The entry of eukaryotic cells into mitosis is regulated by cdc2 kinase activation, a process controlled at several steps including cyclin binding and phosphorylation of cdc2 at Thr161 (1). However, the critical regulatory step in activating cdc2 during progression into mitosis appears to be dephosphorylation of cdc2 at Thr14 and Tyr15 (2). Phosphorylation at Thr14 and Tyr15, resulting in inhibition of cdc2, can be carried out by Wee1 and Myt1 protein kinases (3,4). The cdc25 phosphatase may be responsible for removal of phosphates at Thr14 and Tyr15 and subsequent activation of cdc2 (1,5). Atherton-Fessler, S. et al. (1994) Mol Biol Cell 5, 989-1001. Norbury, C. et al. (1991) EMBO J 10, 3321-9. McGowan, C.H. and Russell, P. (1993) EMBO J 12, 75-85. Wells, N.J. et al. (1999) J Cell Sci 112 ( Pt 19), 3361-71.